The Kansas State Wildcats take on the TCU Horned Frogs on Saturday, December 3, 2016 at Amon G. Carter Stadium. The opening line for this game has TCU as 4.5 point favorites. This season the Wildcats are 4-7-0 against the spread and their over/under record is 6-5-0. The Horned Frogs have an over/under record of 5-6-0 and they are 3-8-0 against the spread. Jesse Ertz finished with 59 yards through the air for Kansas State last week. He completed 4 passes out of 6 attempts for a 67% completion percentage. The Wildcats were led in rushing by Alex Barnes, who finished with 103 yards on 10 rushes. He ended the contest with an average of 10 yards per carry. Byron Pringle was the team leader in receiving with a total of 77 yards and 5 receptions. He finished the game with an average of 15 yards per reception. As a team in that game Kansas State got a total of 25 first downs. Of those first downs, 17 came on the ground while 4 came through the air. They ran 69 total plays for 441 yards for the game. The Wildcats ran for 342 yards on 58 attempts. 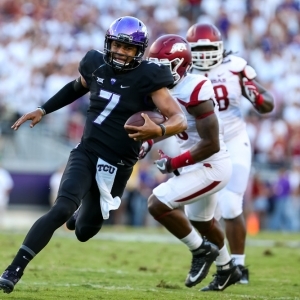 Kenny Hill finished with 150 yards passing for TCU last week. He went 15 for 29, resulting in a 52% completion percentage. The Horned Frogs were led on the ground by Darius Anderson, who finished with 103 yards on 3 carries. He ended the game with an average of 34 yards per rush. Daniel Walsh led the team in receiving with 42 yards and 2 catches. He finished the game with an average of 21 yards per reception. TCU had 25 first downs total. 13 came from running the ball and 10 came from a pass. They ran 76 total plays for 487 yards for the contest. The Horned Frogs ran for 309 yards on 46 carries as a team. Kansas State scores 32.4 points per game on offense this season, which ranks 48th in Division 1. In the passing department, they average 14 passes on 24.4 attempts for a 57.5 percent completion percentage this season. They throw for a total of 153.4 yards per game through the air as well, which ranks them 118th in college football. The Wildcats run for an average of 224.1 yards per game on 43.5 attempts for an average of 5.2 yards per carry. That ranks them 29th in the nation. They also run 67.8 plays per contest and average 5.6 yards per play for an average of 377.5 yards per game, ranking their offense 96th overall this season. The Wildcats average 21.8 first downs per game which ranks them 53rd in the country. They accumulate 54.1 penalty yards per game via 6.5 penalties, which ranks 66th in the nation. Kansas State allows 281.5 passing yards per game, ranking 119th in D-1, and they allow 23.3 points per contest on defense, which ranks 34th. They give up 22.7 completions on 35.5 attempts per game for a completion percentage of 64.1. The Wildcats allow 110.9 rushing yards per game on 30.3 carries for an average of 3.7 yards per carry, which ranks their rush defense 11th in the country. Kansas State allows 392.5 total yards per game including 6 yards per play, which ranks their overall defense 54th in terms of yards per game. They force 2 turnovers per contest and get flagged for 6.6 penalties for 61.2 yards per game, ranking them 101st among D-1 teams. TCU averages 34 points per game this season on offense, which ranks them 40th in the country. In the passing department, they complete 23.6 passes per game on 39.9 attempts for a 59.2 percent completion percentage. They throw for 291.1 yards through the air per game, ranking them 24th in Division 1. The Horned Frogs run for an average of 201.6 yards per game on 37.5 attempts for an average of 5.4 yards per carry this season, which ranks them 43rd on the ground. They also run 77.4 plays per game and average 6.4 yards per play for a total of 492.7 yards per game, ranking them 18th in the country on offense. The Horned Frogs get an average of 24 first downs per game, which ranks 24th in the nation. They average 67.5 penalty yards per game via 7.5 penalties, ranking them 14th in college football. TCU allows an average of 253 passing yards per game, which ranks 93rd in Division 1. Their defense overall allows 27.5 points per contest, which has them ranked 59th in the nation. They give up 20.3 completions on 35.1 attempts for a completion percentage of 57.8 per game. The Horned Frogs allow 168.8 rushing yards per contest on 43.9 carries for a 3.8 average per rush, ranking their overall rush defense 62nd in the country. TCU allows 421.8 total yards per game for an average of 5.3 yards per play, which ranks 73rd in D-1. They force 1.3 turnovers per contest and 5.8 penalties for 47.4 yards in each contest, ranking 36th in the nation.